If you’ve ever dreamt of watching a movie while lounging in a kiddie pool then prepare to be amazed, as one company has created a backyard theater system. Even if college students weren’t the masterminds behind the invention, the CineBox Home Backyard Theater System is going to have a lot of families and friends forgetting about the television. Giving outdoor cinema a whole new look, the theater system isn’t just a projector. 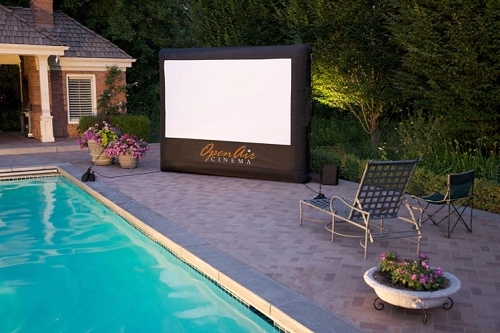 Instead of aiming the picture onto a wall or the side of a house, the CineBox system comes with an inflatable screen! Now most of you are probably thinking “oh no, something else to inflate”, but the screen isn’t that bad. 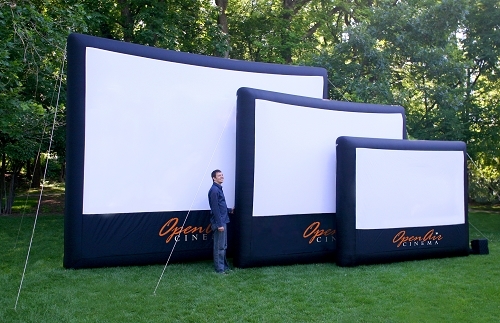 The 123-inch diagonal movie screen is extremely easy to set up and weighs about eight pounds when deflated. The fact that it fits in a duffel bag alone makes the setup process seem very simple. - Sanyo 2300 Lumen DLP Projector. - User-friendly audio mixer with DVD, MP3 and microphone compatibility. - LED light (for operations at night). - A OneBox Muffler for air blower. Along with giving you a great product, the CineBox system has everything you need in order to set things up. Another great aspect is that it’s almost perfect for any location or event such as a family BBQ or gathering with friends on the beach. To find out more about pricing and where you can purchase the backyard theater system, you can visit the company’s website or buy it at Amazon (and save on sales tax) . Want The Coolest Table In Infinity? Check Out The Infinitum Table! I would love to be the first on the block to have one. I'm not spoiled, but I want one now, Now, NOW!! !